Spicy Chik'n Vegan Patties Made with Non-GMO Soy Satisfy your junk food cravings while respecting your dietary preferences with these delicious BOCA Original Chik'n Vegan Patties. 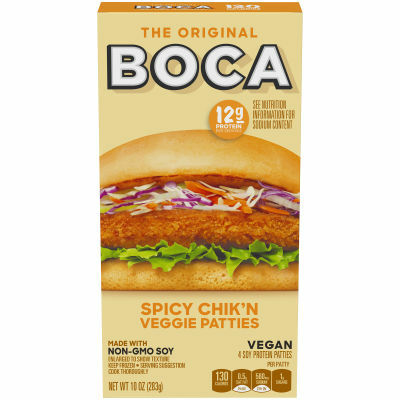 Made with non-GMO soy, these juicy BOCA Chik'n vegan patties are a delicious vegan alternative. They are packed with 12g of protein and 130 calories. The package includes four soy protein patties, so you can enjoy them together with friends and family or keep some extras in the freezer for the next time a craving strikes. Serving size 1 patty (71g).